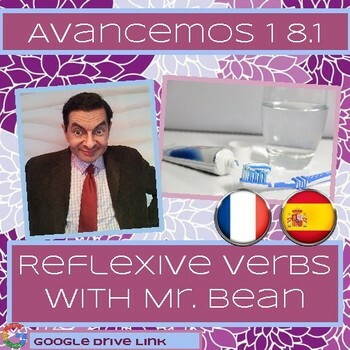 Practice reflexive verbs! Students watch an episode of Mr. Bean (silent tv show, very funny) getting ready in the morning and write subtitles for what happens. Very similar to doing a movie talk with a silent film but way funnier. The worksheet includes timestamps where they should add subtitles (eg. where Avancemos 1 vocab appears) and defines in Spanish some extra vocab. Students also decide when to (or not to) use reflexive pronouns since not all subtitles are actually reflexive. The paper gives directions to do this on paper or offers a project option with embedded subtitles on Kapwing.com. Also works for French 1/2 with very minimal editing. You get the resource through an editable Google Doc link that copies to your drive.